In hands-on testing, Principled Technologies (PT) found that migrating a VM from an Intel Xeon processor-based server to an AMD EPYC processor-based server required downtime. Durham, NC, March 18, 2019 --(PR.com)-- For businesses that rely on various types of cloud environments to run their applications, the ability to move VMs to one server to another offers flexibility that supports business agility. Technologies such as VMware vSphere vMotion enable live migration of VMs with zero downtime, as long as the servers share the same underlying architecture. When migrating between servers powered by processors with different architectures, the only option is to shut down the VM before migrating it. In hands-on testing, PT migrated VMs in a homogeneous environment of servers powered by current and older Intel Xeon processors and in a heterogeneous environment consisting of both Intel Xeon processor- and AMD EPYC processor-based servers. 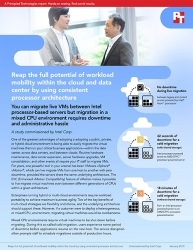 Live migration of VMs in the former environment was seamless with no service interruption, while “cold migration” of VMs in the mixed CPU environment incurred downtime, which would require planning and place a burden on administrators. To learn more, read the report at http://facts.pt/8zysd88, the summary at http://facts.pt/wq2otq2, or the infographic at http://facts.pt/sa1txso.